Located at the Auditorium of PT PLN (Persero) Jakarta, Monday (18/3), Minister of Energy and Mineral Resources (ESDM) Ignasius Jonan, opened the event for the dissemination of ESDM Ministerial Decree Number 39 K / 20 / MEM / 2019 dated February 20, 2019 concerning Endorsement PT PLN (Persero) Electricity Supply Business Plan (RUPTL) in 2019 to 2028. The Minister of ESDM revealed the changes in the RUPTL of PT PLN (Persero) in 2018-2027 need to be carried out because of the dynamics of electricity demand growth and electricity infrastructure development, so that changes to the scope and capacity of plants, commercial operation date (COD), and the addition of new projects for increasing the reliability of the electricity system. On this occasion Jonan reiterated his support for the use of EBT and asked PLN to accelerate the process of developing EBT plants in Indonesia. "The government sets new renewable energy in the energy mix at a minimum of 23 percent in 2025. This is a very big challenge. So the Government decides that the EBT plant initiative under 10 MW does not need to be in the RUPTL, the goal is to pursue an energy mix from EBT," Jonan said in in front of representatives of Ministries / Agencies, Regional Governments, Business players, as well as other stakeholders in the electricity subsector who were present. 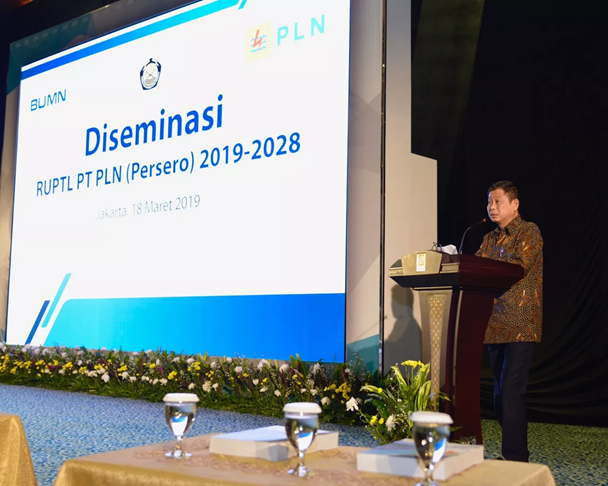 Through the RUPTL of PT PLN (Persero) 2019-2028, the ESDM Ministry has instructed PLN to continue to encourage the development of renewable energy. In this latest RUPTL, the target of adding electricity from renewable energy until 2028 is 16,714 MW. According to Jonan, the other important thing is the expansion of access to electricity, the Electrification Ratio last year (2018) rose by 14% compared to the last four years. "According to the President's direction, energy must be fair, the challenge (price) must be affordable," said Jonan. Jonan asked PT PLN (Persero) to realize the target in 2028 as stated in the RUPTL such as: total plant construction plans of 56,395 MW, electric power transmission network of 57,293 kms, substations of 124,341 MVA, distribution network of 472,795 kms, and distribution substations amounting to 33,730 MVA. In this 2019-2028 RUPTL, the Government also encourages the use of environmentally friendly power generation technology. This has been done, among others, by encouraging the application of Clean Coal Technology (CCT) PLTU technology. The Ministry of Energy and Mineral Resources also instructs PLN that the energy mix of gas can be maintained at a minimum of 22% in 2025 and so on, to support the integration of intermittent (Variable Renewable Energy) EBT plants. The government also commits that the use of gas for electricity generation prioritizes gas at the wellhead. Regarding the use of fuel for electricity generation, it is limited to a maximum of 0.4% starting in 2025 which is used only for rural areas and in the 3T area (Front, Underdevelopment, and Outermost).